The Apogee Element 24 is a Thunderbolt Audio I/O Box for Mac that combines the very best technology from Apogee's class-leading line of products to create a professional 10 in x 12 out recording platform. With technology lifted from products such as the mighty Symphony I/O Mk II, Ensemble Thunderbolt and Groove Amp, The Element 24 delivers exceptional recording quality and powerful performance. The Element 24 features Apogee's signature analogue to digital conversion technology, capturing every subtle nuance of your recording in superb detail by minimizing the effect of noise and maximizing signal quality. On the flip side the Element 24's digital to analogue converters breath new, exciting life and unmatched warmth into your virtual instruments. This refined clarity also greatly aids mixing decisions and minor level adjustments. The Apogee Element 24 packs two combi mic/line/instrument inputs with premium preamps and selectable +48V Phantom power. These exceptional preamps are equipped with Apogee's Advanced Step Gain Architecture™, meticulously crafted analogue circuitry that works efficiently across a wide gain range of 0-75dB to deliver excellent bandwidth and little to no distortion. The Element 24's digital audio clock has an almost unparalleled efficiency, acting as the glue holding all your the elements of your digital audio system, the clock synchronizes every element of the AD/DA process and ensures stability reigns. 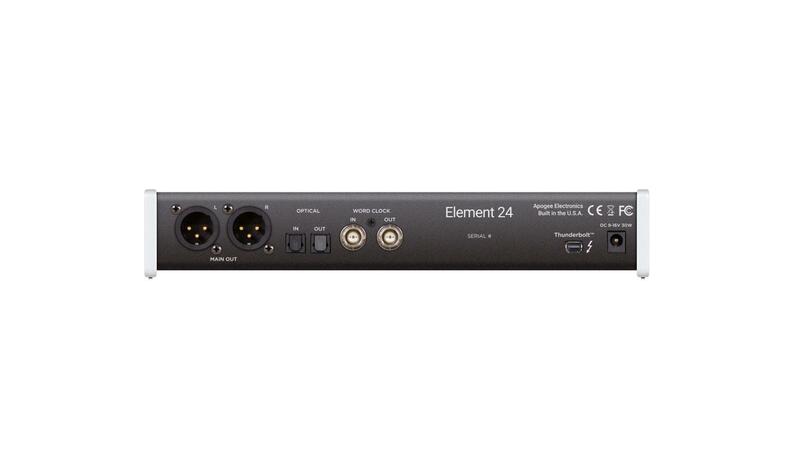 Superior Thunderbolt connectivity gives the Element 24 a high level of efficiency, it uses DMA (Direct Memory Access) technology to run more elements and monitor your work through a DAW at a far lower buffer setting. The result is low-latency performance and stability without compromising your computers CPU power. 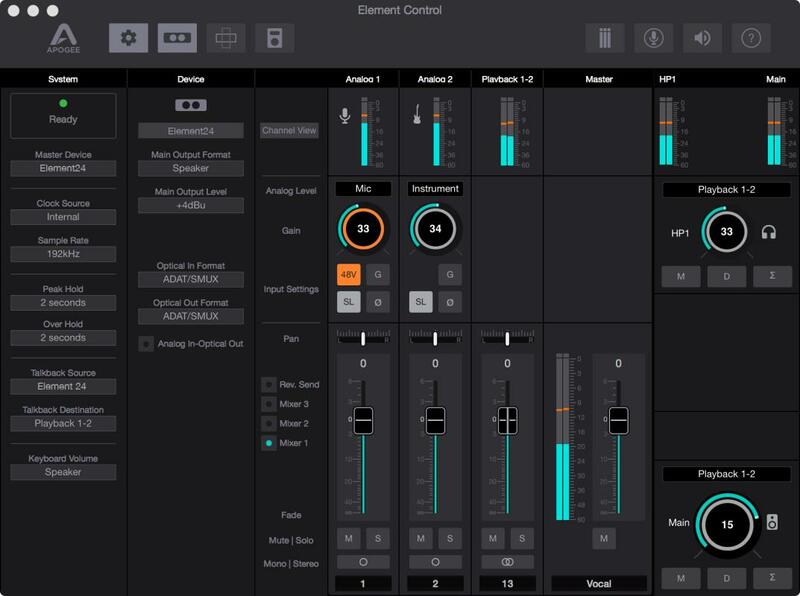 The Element interface range is designed to work in perfect unison with Apogee's 'Control App' for Mac. This intuitive program gives you precise control your I/O, select input type, adjust input/output levels, configure up to 3 separate low-latency mixers and even more. The App works in unison with your keyboard so you can make quick adjustments and selection using only your arrow keys to speed up the process. The Control App has also been developed for iOS and can be downloaded to your iPad, iPhone or iPod Touch. Always keep one eye on your hardware settings thanks to the Element Essentials Window, this slim tab-like window displays all your hardware settings in a manageable window that fits right underneath or above your DAW, allowing you to maintain focus whilst writing and recording. The Apogee Element 24 also boasts direct integration with Logic Pro X allowing you to make fine-tune input adjustments directly from the Logic Pro X mixer, speeding up work-flow and allowing you to maintain focus without leaving your project.